Rain that is. Southwest Michigan seems to be getting quite a bit today. There is a small leak in our roof - in several places. With buckets safely under the offending leaks, I can now focus on the water that is slowing filling my basement. An indoor pool has always been a dream of mine, but honestly. Why do we tolerate this? Because we a slowing working our way toward a new addition. These decisions are big and we wouldn't want to rush them. To make a roof replacement only to rip it off the next year for the addition is silly. In the mean time, it pains me to report that sweet Juliet has met her demise and was frogged yesterday. Due to a slight miscalculation on my part, not enough yarn was purchased to complete the sweater. After checking several sources, I found out that the yarn has been discontinued and no one seems to have any. In addition, the sweater seems to be HUGE and I am knitting a small. The weight of double stranded yarn made the bodice stretch too much for my liking. New revelation - anything knit in a double strand of worsted or in a chunky yarn is too bulky for my frame. 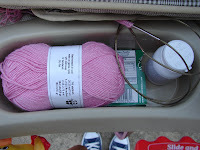 My thoughts are turning to knit this up single strand of worsted, in a different gauge. Having never attempted this feat, let alone without a net, I think I will table this for quiet, up-north knitting. At 8:46 am we will remember. We took a little family trip to Cedar Point! 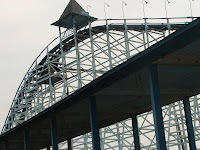 I love thrill rides. The taller, faster and zoomier (my own word) the better. RM and soccer chica love the rides too. Boo-boo, not so much. So we were iffy on whether or not he would have a good time. It could have turned out as a day of motorized cars and Jr. Gemini for us. Yet, he found his inner coaster love and can't be kept off them. As for Bean, she definitely wouldn't ride any rides this year. Our model of baby definitely does not come equipped with thrill ride capabilities. We will have to purchase that up grade when she gets to be 48" tall. 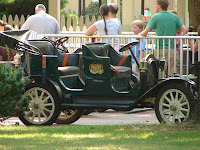 She reclined gracefully in the stroller, choosing to be chauffeured around the park in style. We had a day of fun, thrills, and trip to first aide. Suffice to say the Snoopy Balloon ride did RM in. He can ride all the coasters, ski down double black diamonds, hike to the top of mountains, etc. But when it comes to the kiddie rides that go in a circle . . . he's toast. Having never had motion sickness before (and being a bit of a drama-king when it comes to feeling ill) RM thought there was something seriously wrong with him. He was certain it was a stroke, heart attack or some dreaded disease. So off to get some Dramamine and an hour of rest at the First Aide Station. For the rest of the day, it was RM not Boo-boo who was content to ride the motorized cars. Note to all mothers nursing or not: Both First Aide stations in the park have a beautiful nursing room and kid area, complete with TV and games. This was a god-send for nursing and once discovered, used frequently. BTW - it's air conditioned. So while RM and I took turns waiting for the kids to ride the coasters, I did a little knitting. I mentioned here that I bought some Panda Bamboo Silk at Your Local Yarn Shop. A hat for Bean would be the right choice because it is such a lovely shade of pink. Never having knit with this yarn before, a gauge square is a prerequisite. I think the hat will be a simple stockinette stitch and knit in the round. As for embellishments, I have vision of some flowers - big and flashy for Bean's inner diva. Did you take note of the tennis shoes I was wearing? They are my beautiful Chuck Taylor's that I received for my anniversary of my birthday. I wear them everywhere. The other items on the stroller were necessities for the day. Gum to keep away bad breath. I always indulge in the over-priced, uber-greasy park food. Plus pain reliever to take away the various headaches that arise when we travel with a 16 year old (who wants nothing to do with kiddie rides and never smiles), a 6 year old (who discovered that he loves roller coasters - yea - and wants to ride them all NOW) and a 6 week old (who just wants to eat, sleep, and poop). In the future, I will be knitting circles around RM as he sits out the circle amusement rides.